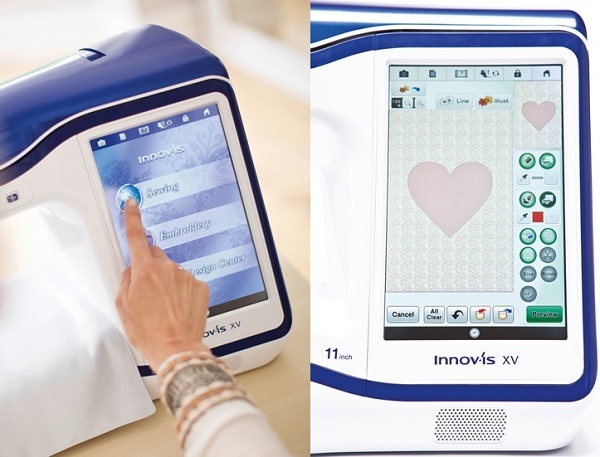 The Brother Innovis XV is the most obliging embroidery machine ever. Beautiful on the eye and packed with all the features an embroiderer and quilter will use over and over, it really does deserve the description of Dream Machine. 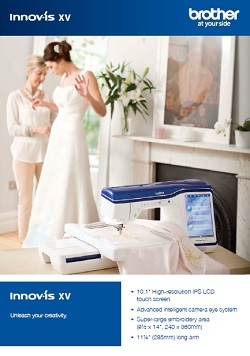 Bigger doesn't always mean better but with the Brother Innovis XV embroidery and sewing machine, better it definitely is! 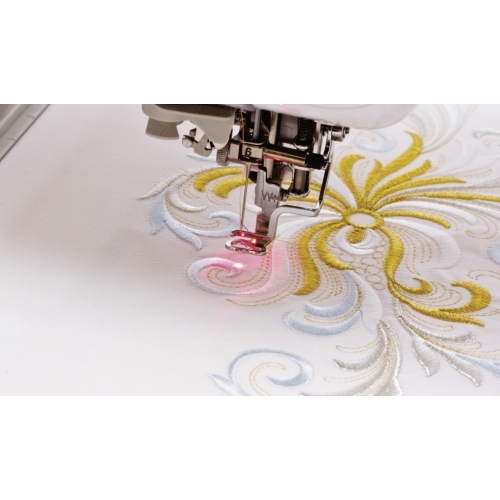 Improvements to both the largest embroidery hoop and the embroidery unit result in accurate large-frame embroideries while the long arm design will accommodate quilts in both sewing and embroidery mode. When your embroidery frames get larger - this new one is a fantastic 240 x 360mm (9.5 x 14 inches) - you need extra stability built into your frame. The steel reinforced sections and new rubberised grip hold the fabric better than anything we've seen before. Take a quick look in Keith Lords video explanation. 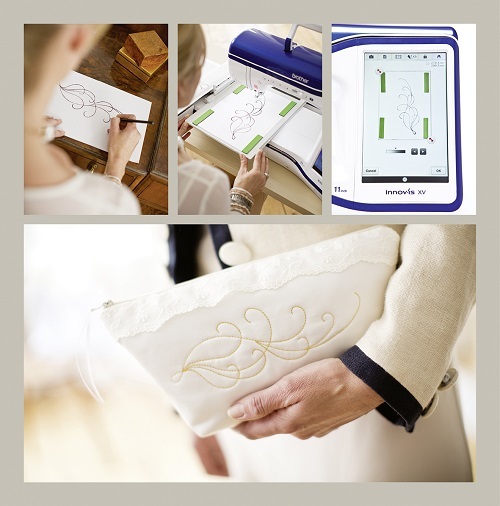 As soon as you encounter the Brother Innovis XV sewing and embroidery machine the tablet-style touch screen just blows you away. Detail, clarity, colour and speed are just simply awesome. Every screen function is logical and simple to follow. You can see sewing stitches in magnificent detail and editing or combining your embroidery designs is now so easy to see that you'll take your specs off! In this video clip Keith demonstrates why you would want to own this delicious piece of kit! Unbelievable and marvelous! 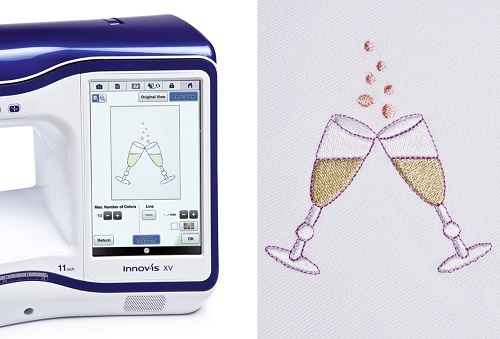 The Brother Innovis XV can quickly scan an image from the supplied Scan Frame into the machine, convert it into embroidery and then offer the option to stipple inside and/or outside the design. You may prefer to convert it into fill stitch and running stitch. There’s also an option to just import an image from your usb stick and convert to embroidery. The process is quick and easy, the results dynamic! Free-motion stippling is an art that eludes many quilting enthusiasts and until now you would have needed to create this auto-stippling in embroidery software such as PE-Design on a computer. 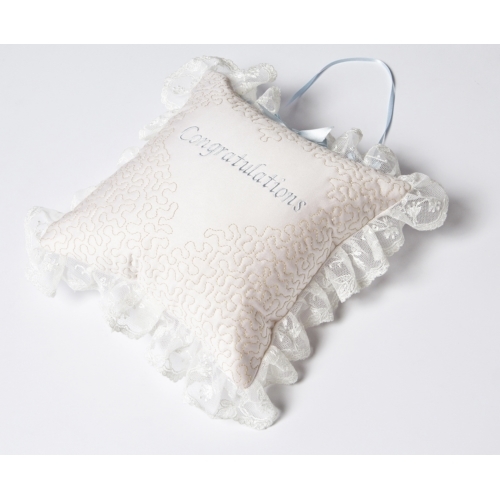 It's just so easy to add a stunning effect that runs effortlessly around the contours of a design you have just finished sewing out. 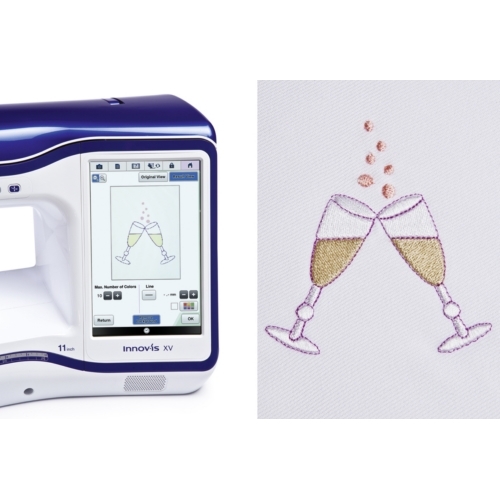 You can automatically create embroidery from an image using My Design centre as well. During our open-day demonstration a customer brought a Unicorn image on his USB stick and the conversion to embroidery was instant. 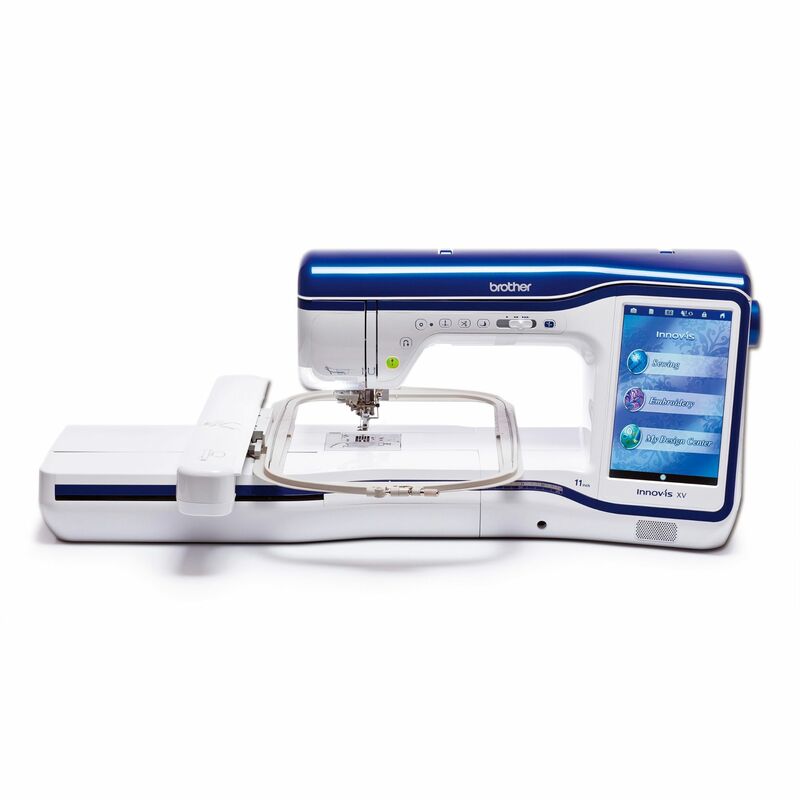 The Brother Innovis XV Dream Machine can be purchased from Lords Sewing with video tutorials that can be watched on the fabulous built-in screen whenever needed. 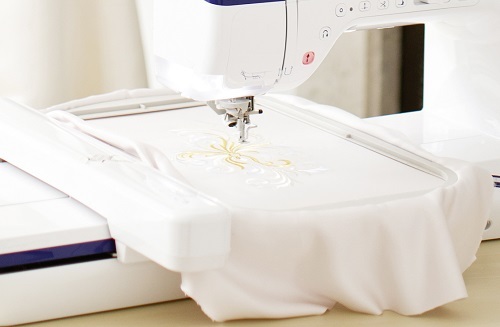 Lords Sewing is the UK's leading home embroidery specialist centre and number one dealer for the Brother Innovis XV - we're available to help 7-days a week and these tutorials are part of the service we offer to help you get the best from this amazing machine. This machine has everything. I love that it is so easy to use, has so many useful parts. 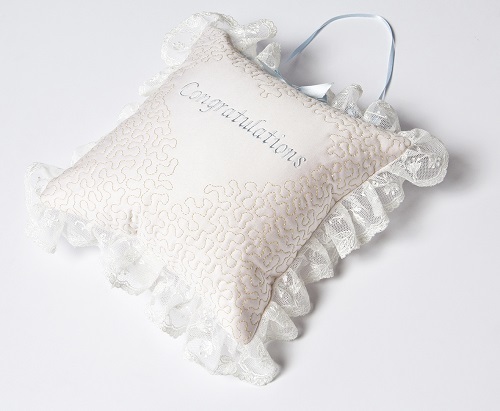 The embroidery is beautiful and again so easy to use. If you want the best then this machine is perfect and dealing with Lords Sewing means you get the very best deals and best service. I thoroughly recommend this machine and Lords Sewing. Fabulous product. Way beyond my expectations. Fantastic service. I use Lords a lot and am always delighted with the quality products,speedy delivery and customer service. A wonderful machine. I love Brother machines but they have really excelled themselves this time. It is a limitless machine with detailed embroidery but I cannot express how good the sewing features are. The precision offered by the infra red guide is excellent expecially for patchwork. Lords is a long way from where I live is always well worth the journey Keith and the team are second to none in their knowledge and customer service. I have had this Dream machine for a few months now, and have just come up for air. Wow and double wow, this machine does more than i could have imagined, now teamed up with the Innovis XV Dream Machine Tutorial video which Keith Lord and his team have put together there is no holding back into which i can produce. And Lords Sewing are so professional and there service is second to none. i will away's use this wonderful company. Brother Innovis XV Dream Machine - well what can I say, this is such a fantastic machine, I've had it about 2 weeks now and cannot stop using it, my husband has pried me away from it today as he is fed up with his own cooking. I cannot praise Kirsty and the Lords team enough for such fantastic service and delivery. The video tutorials that Keith Lord has produced are so useful and I am learning a lot by watching them. I must also mention Kirsty and give her a big thank you, as she installed the upgrade onto the machine before they shipped it out to me. I've only owned this machine for a few days, but I am totally in love with it. I'm amazed at what it can do and am thoroughly enjoying learning to use it to the full. I'm impressed with the beautiful stitches, the huge screen and clear displays. 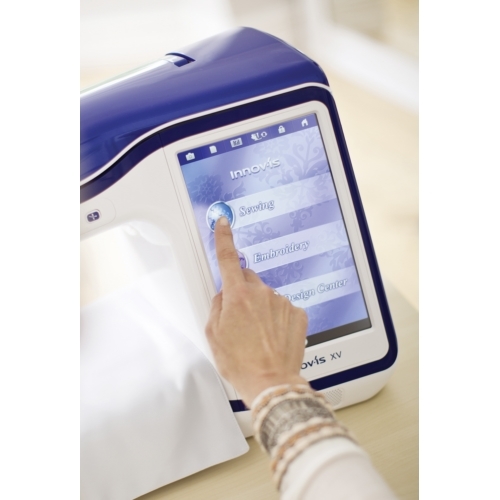 I have used it for sewing, free motion, scanning and embroidery and had excellent results from all aspects. One very happy customer. I have had the Brother XV for around a couple of months now and absolutely love it. I traded my Brother V5 for it and have no regrets. The XV does everything apart from the washing up! Lords arranged for the pick up of my V5 and the XV was delivered at the same time. The scanner is amazing. There is a lot to learn but the XV comes with on screen tutorial videos and the manual is huge but easy to follow and understand. There is also a wealth of information on YouTube. I am sure if you bought the XV you would be very happy with it too.